Play new great game Super Hunting for free at Dinosaursgames.net - website for all dinosaur games online. Super Hunting is an action dino shooting game in which your task is to shoot all wild animals and become the world's best hunter with a variety of weapons! Super Hunting is now introducing the best animal hunting games for young teens and wildlife lovers. Live in huge green jungle forests. 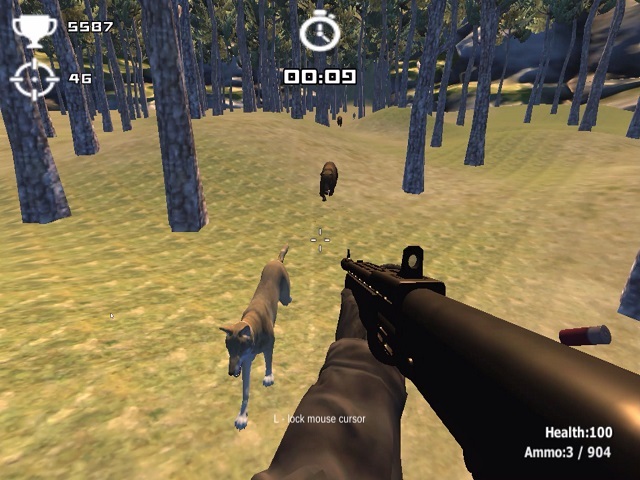 In the game, you are equipped with powerful weapons to eliminate the real angry animals that are wandering in the super jungle and on the top high mountains. There are a lot of animals in the forest, they are very dangerous animals such as wolves, wild pigs, bears etc. They are attacking you. So you need to eliminate by shooting them down. Be careful! avoid bites and always has your gun loaded. Because your goals in here are to survive as long as possible, and catch as many animals as you can. Will you survive 5 minutes in the hell? You are a super sniper who is an ultimate animal shooter. The big forest jungle has top high mountains and tall green trees. The jungle is full of wild animals like bear, wolf. Play now this action dino shooting game now to experience the real dinosaur hunting and best jungle sniper shooting. Escape chase the deadly dino attacks with different assault rifles and weapons on Safari Mountains. Try to kill as many animals as possible. Let's enjoy and have a relaxing moment with Super Hunter! Have fun! C to crouch, R to reload and P to pause.